With Body Gospel Core Revelation, you can challenge your core and lower body in just 20 minutes. 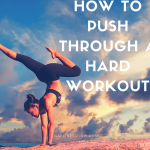 I love that you can get an effective workout done in less than 30 minutes! Starting out with an invigorating stretch, Donna Richardson gets you warmed up good before starting the core workout. These stretches are quite enjoyable and done from a seated position on the floor. All the while, great gospel music is playing in the background. After 2 minutes, you grab those unique Body Gospel resistance bands and do Temple Twists that really work your waist. If you can’t do the exercise, you can follow the modifier. Next up are Roll Downs. These are fantastic for your core. Using the Body Gospel bands provides a little extra resistance while you engage your abdominal muscles, and helps you control the movement. You work up to a nice Bicycle exercise using the bands and then onto Inner Thigh Toning from a lying down position. These moves are fantastic for toning and Donna encourages you the whole way! Several more exercises target your outer thighs, abs, and buns. The Core Revelation wraps up with a nice and well-deserved stretch. These exercises are great for beginners to get started working on a stronger core. If you already have 6-pack abs, this workout is not for you! Each exercise is easy to follow and Donna Richardson talks you through it while showing you the right way to do it. And don’t forget this – in order to see results, you need to adopt a healthy diet. Drinking plenty of water and staying away from junk and processed foods will enhance the effect of toning exercises. Body Gospel includes a great Feed Your Body, Feed Your Soul Nutrition Guide that contains delicious recipes to support your fitness program. With Body Gospel, most people start seeing results in 30 days. Are you ready to become faithfully fit and fabulous?